In 1943, Vladimir Nabokov, a novelist and lepidopterist, coined the name Karner blue after the city in New York where he first discovered the butterfly. This species goes by several names including the orange-bordered blue and Edward's blue butterfly (Lycaeides melissa samuelis 2010). 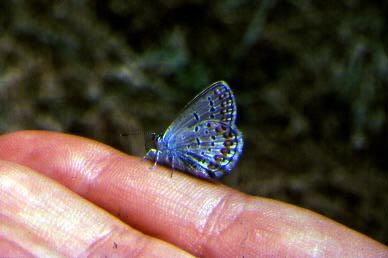 Characteristics of each classification which pertain to the Karner Blue Butterfly are listed below. Kingdom Animalia: Animals are organisms which obtain energy from other organisms such as plants or other animals. Adversely, plants are primary producers relying on their own abilities to make their own food. Animals lack ridgid cell walls that can be found in most plants and fungi. Phylum Arthropoda: Arthropods are bilaterally symmetrical and have segmented bodies which hold paired, jointed appendages. Class Insecta: Insects are characterized by having three pairs of legs, a three part segmented body, one pair of antennae, wings, and most often compound eyes. Order Lepidoptera: Includes all butterflies, moths, and skippers. Distinct characteristics include scale covered wings and process of complete metamorphosis during life cycle. Family Lycaenidae: Includes all of the “blues” meaning all of the Lepidoptera which have relatively the same blue coloring pattern. Genus Lycaeides: Includes all of the “blues” which habitate the ecosystems of the Northern continents of the world. Species Lycaedies Melissa: Habitate northern parts of North America and use herbaceous shrubs as host plants. Lycaedies melissa samuelis: Distinctive coloring as described on the main page as well as distinct nutrition as described on its respective page. All above information was accessed from The Encyclopedia of Life (Lycaeides melissa samuelis 2010).